The much-hyped film Arth-The Destination, directed by Shaan Shahid, starring Shaan, Umaima Malik, Uzma Hassan and Mohib Mirza, has been cooking up a storm since its release, being handed an ‘F grade’ from the audience and critics alike. Despite the fact that the box office figures have not yet been released to the public, it is now common knowledge that the film failed to attract cinema-goers. 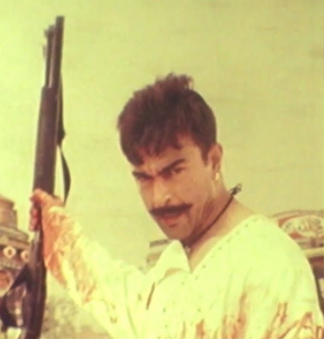 Shaan Shahid, however, has taken upon himself to defend his film amid negative audience reaction and poor box office sales. His desperation is evident by a Facebook post that was later deleted. 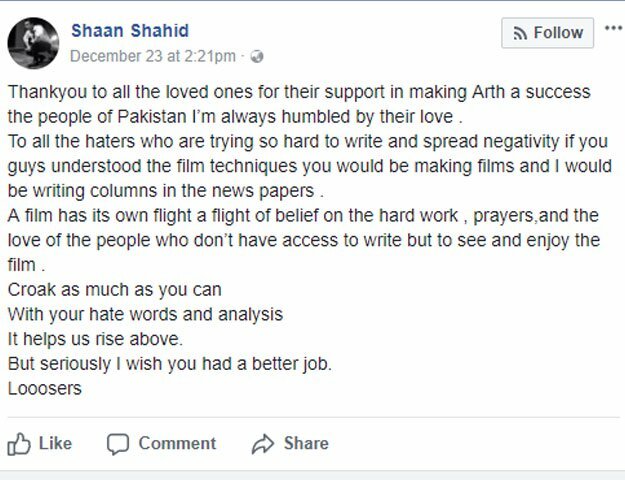 In the post, Shaan wrote that Arth was a nicely made movie but it was dissed by some critics ‘from Karachi,’ deliberately as it was made by a director from Lahore. He further wrote, “Why against something that is released from Lahore and what is the problem with ‘Karachi walas’ going against something which was in my view a very well made movie.’ Shaan obviously did not want to believe that the movie had apparently not been received well. He further blamed ‘a lobby discouraging Pak cinemas,’ for dissing an otherwise outstanding film. 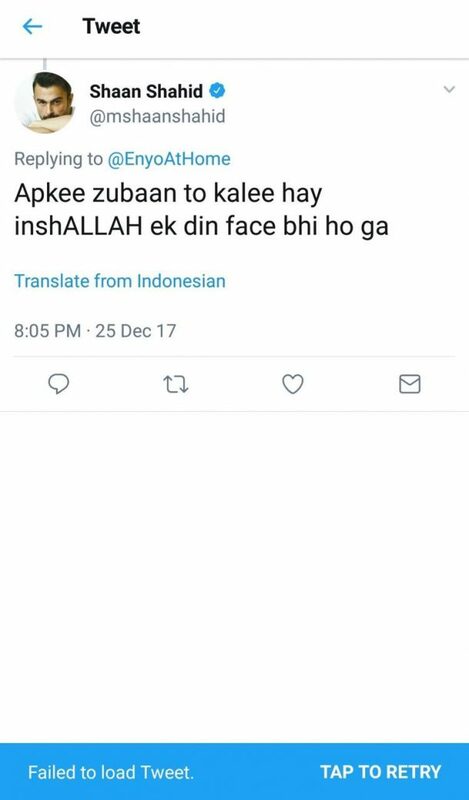 Shaan is noticeably not very happy about all the criticism he has been receiving for his passionate undertaking, as the film star has now taken upon himself to aggressively respond to each and every tweet criticising the film, on the social media. He has also been incessantly retweeting and posting praises for his film. The tweet was apparently not even directed towards him. In response to one tweet he wrote, “my managment handel’s the account and this is not what we wrote but a local journalist wrote it and we posted it,” suggesting that the facebook post was written by a local journalist and they just reposted it on Facebook. Shaan’s sheer incapability to handle criticism shows that the Pakistan film industry and its actors, directors still have a long way to fully mature since one very obvious sign of maturity is the ability to handle criticism well.